Set in London in 1953, this tale relates the problems of Rosy Gilchrist who, demobbed from the ATS eight years previously, is attempting to lead an untroubled life working at the British Museum. However, such hopes are brutally shattered by the murder of her aunt - an embarrassingly colourful lady - dispatched in more than bizarre circumstances. Since aunt and niece had little in common Rosy is reluctant to become involved; but insidiously she is drawn into a mesh of murky intrigue, wartime espionage and personal danger . . . Who for example is the wooden-legged night visitor? What precisely is the ghastly Miss Collinger seeking? Is the Jesuit lush as innocent as he seems? And what guilty secret does florist Felix Smythe harbour - or for that matter the self-serving artist Clovis Thistlehyde? Who are Rosy's allies and who the predators? And what exactly does happen on the seafront at Bexhill . . . ? "​For classic crime enthusiasts A Little Murder ticks all the right boxes ... The result is a delightful mix of mystery and nostalgia, just perfect for the deckchair." "​. . . All is washed down with the contents of numerous decanters. 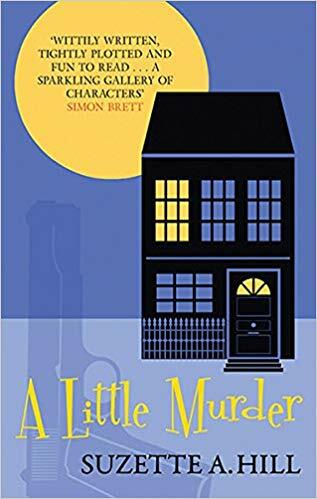 Wittily and fluently written, with a neat plot that twists and turns to a satisfying conclusion, A Little Murder is fine entertainment." "​A perfect mix of funny and acerbic, with a cast of colourful characters and a school of well deployed red herrings. A Little Murder is wholly delightful." Laura Wilson, author of Stratton's War, Dying Voices, The Riot etc. etc. "​If Barbara Pym had decided to write a murder mystery, it might have turned out a bit like A Little Murder, with its drolly amusing characters and persistent digs at 'polite' society . . ."